Spellweave follows in spellcloth's footsteps of having absolutely no survivability attributes on the gear. 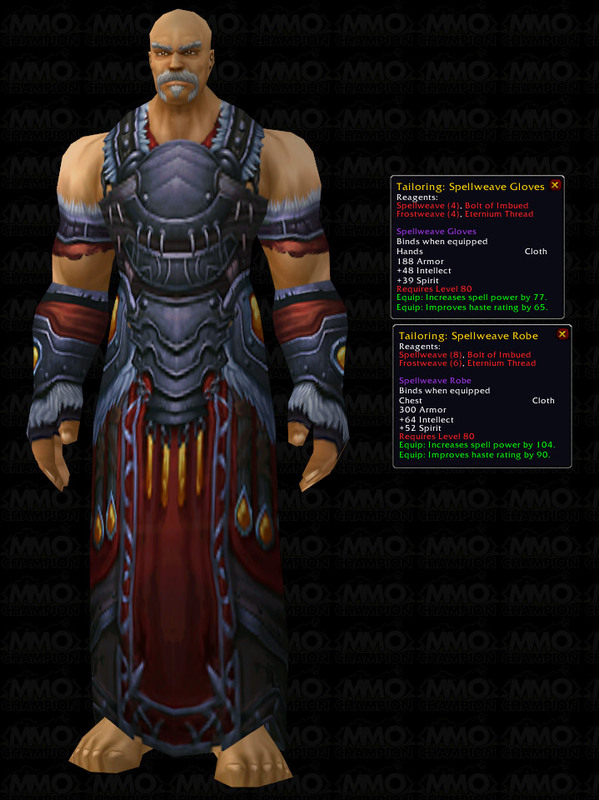 Despite likely being the "Mage set", Ebonweave will help with early raids due to +Hit gear. If you don't mind waiting forever for this, I'd go with Ebonweave. Arcane Mages don't like haste. Arcane Barrage deals its damage upfront and has a set 3 second cooldown. So this robe is rather inadequate for all mages in comparison with the Ebonweave one. You guys are completely underestimating to haste on this piece. According to MaxDps.com (which is a very reliable sight), this cloth piece has almost 20 more dps than ebonweave. Haste Rating can improve you DPS by a lot, any caster will want a good share of it. Even as fire (which loves your crit chance), this robe is better then ebonweave. all mages get a mana regen with spirit, as long as you use mage armor. you can also get the mage armor buff glyph which increases mana regen during casting to 50%. I'm thinking this would be a good pre-raid Disc Healing set for Priests. Spirit helps with regen talent, and I don't have to worry about hit on my heal spells, and I can speak from experience that haste is probably the most important stat for priests since we lack the plethora instant cast spells of druids and our multi-target heal (Prayer of Healing) takes 0.5 seconds longer to cast than Shamans' Chain Healing. Now I wouldn't wear this into a battleground, but if you have a tank that can hold threat you shouldn't be getting hit, and the faster you can get off a mass dispel or a flash heal, or channel Penance in under a second, the better. Is it me or are blizzard trying to smother us to death with haste in this expansion, I'm speaking generally about crafted and rep reward items. If spirit had a base regen while casting for mages I'd have no complaints about the spirit either. The Spirit which takes place in Lock builds is not enough to warrant any large changes in upcoming patches, at least none that several Warlocks see. Yes, it makes a partial difference, but not enough for any Lock to ever consider wearing this chestpiece. This is actually decent for warlocks. Fel armor gives us 30% of our spirit in additional spellpower (39% with 3/3 improved fel armor), so it's like an additional 16-19 spell damage. Also the best pre-raid holy priest robe. Disregarding the lack of stamina, it's actually pretty good for resto and balance druids. This can't be disenchanted, but I'm not sure why. There are much cheaper things to craft that will disenchant into Abyss Crystals, including the Spellweave Gloves (according to the in-game tooltip, anyway), but when this becomes obsolete, it isn't even worth anything selling to a vendor. Here's to hoping this oversight gets corrected. This robe would fit my priest well, whether shadow or healing spec'd. What about the Talent Pyromaniac? It now grants 50% Mana Regeneration while casting. Now the +Spirit on this piece of armor makes more sense. 90 haste is a very wonderful stat for healers like priests. The lack of stamina can be fixed with the 270 hp enchant instead of +10 all stats, because this chest has already an high amount of Intellect and spellpower. so who teaches this? I checked the dalaran trainers, BT and HF and they just sell spellweave glove recipes. As Spriest you can't beat this with any 10-man pre Ulduar piece and the only Naxx25 pieces that are better are from Noth and Maexxna, but they don't win by much. It's far better then just saying "not a bad little robe for Spriests either". This piece can carry you until you get The Sanctums Flowing Vestments from OS25, until then, everything else is negligible. In my opinion, this is not a mage robe. Yes, mage can still use it well, but it is not a perfect choice for mages. Personally, I think Ebonweave Robe is better for mages than this one. Sure, more haste rating means faster casting and faster DPS, but the spirit stat is not very important to mages. Hit rating or critical rating is bettter in my opinion. I think this is better for healing class such as priest. I think of this as the Destro Lock set, as it was "Spellfire" back in BC days. The haste and spirit for the spell power buff locks get from that stat with fel armor make it clear to me. It definitely has the colors of a lock set. "When starting out" spec as Arcane and get this! You're already hit-capped for 5man heroics and can skip gear with +hit. If you want to do some early raiding a set of Ebonweave isn't a bad idea, but you're probably better off just running all the 5mans you can through dungeon finder and building the T9 set. Not to mention the ungodly amount of spirit on this crap. This is surely not a mage robe, as only Arcane mages have any use for spirit. Other mages wear Molten Armor either because they can or because it's better regen for them through Master of Elements. So it's not a Mage robe, refrain from taking it. Im new to Mage but I would think that, as a Deep Firemage with Molten Armor the Spirit and Haste on this would be fantastic. Either way I have both this and Ebonweave, so some in-game experimentation is in order. The lack of +hit is disappointing, but Im sure you can find hit slathered all over some other pieces.